For information about the genre, see Military art. Willem van de Velde the Elder (c. 1611–1693) was the official naval war artist of the Dutch Admiralties during the first two Anglo-Dutch Wars in the 17th century. A war artist is an artist who depicts scenes or aspects of war through their art. The art might be a pictorial record, or it might commemorate how war shapes lives. War artists explore the visual and sensory dimensions of war, often absent in written histories or other accounts of warfare. A war artist creates a visual account of the impact of war by showing how men and women are waiting, preparing, fighting, suffering, celebrating, or destroyed, as in Vasily Vereshchagin's 1871 painting, The Apotheosis of War. The works produced by war artists illustrate and record many aspects of war and the individual's experience of war, whether allied or enemy, service or civilian, military or political, social or cultural. 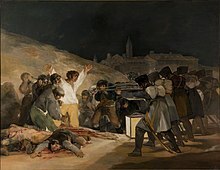 The role of the artist and his work is to embrace the causes, course, and consequences of conflict, and has an essentially educational purpose. Artists record military activities in ways that cameras and the written word cannot. Their art collects and distills the experiences of the men and women who endured it. The artists and their artwork affect how subsequent generations view military conflicts. For example, Australian war artists who grew up between the two world wars were influenced by the artwork which depicted the First World War, and there was a precedent and format for them to follow. Official war artists have been appointed by governments for information or propaganda purposes and to record events on the battlefield, but there are many other types of war artists. These can include combatants who are artists and choose to record their experiences, non-combatants who are witnesses of war, and prisoners of war who may voluntarily record the conditions or be appointed war artists by senior officers. In New Zealand, the title of appointed "war artist" changed to "army artist" after the two world wars. In the United States, the term "combat artist" has come to be used to mean the same thing. William Simpson was an artist-correspondent who sent artwork to London from the front during the Crimean War. Alfred Waud was an American civil war pictorial newspaper illustrator. Ogata Gekkō and Tsuguharu Foujita created woodblock prints for Japanese publications. Ronald Searle recorded life in Japanese POW camps. Emmanuel Leutze's 1851 studio painting of Washington Crossing the Delaware is historically incorrect, and Leutze was born decades after the event his painting depicts, but this work has become an icon of popular culture. Michael Fay is an official US Marine war artist, one of only three whose work depicts the battlefronts in Iraq and Afghanistan (2007). The American panorama created by artists whose work focuses on war began with a visual account of the American Revolutionary War. The war artist or combat artist captures instantaneous action and conflates earlier moments of the same scene within one compelling image. Artists are unlike the objective camera lens, which records only a single instant and no more. In 1917 the American military designated American official war artists who were sent to Europe to record the activities of the American Expeditionary Forces. In World War II, the Navy Combat Art Program ensured that active-duty artists developed a record of all phases of the war and all major naval operations. The official war artist continued to be supported in some military engagements. Teams of soldier-artists during the Vietnam War created pictorial accounts and interpretations for the annals of army military history. In 1992 the Army Staff Artist Program was attached to the United States Army Center of Military History as a permanent part of the Museum Division's Collections Branch. The majority of combat artists of the 1970s were selected by George Gray, chairman of NACAL, Navy Air Cooperation and Liaison committee. Some of their paintings will be selected for the Navy Combat Art Museum in the capital by Charles Lawrence, director. In January 1978 the U.S. Navy chose a seascape specialist team: they asked Patricia Yaps and Wayne Dean, both of Milford, Connecticut, to capture air-sea rescue missions off of Key West while they were based at the nearby Naval Air Station Key West. They were among 78 artists selected that year to create works of art depicting Navy subjects. James Dietz, born 1946, contemporary war artist. aka. Jim Dietz. Ted Egri, 1913-2010 Egri served in the U.S. Navy, and painted while at sea. Examples of his WWII paintings have recently been donated to the U.S. Navy Museum, 2016. Sergeant Than Naing of Wounded Warrior Battalion, East, sketched by Robert William Bates, 2011. War artists have depicted all the conflicts in which Australians have been called to combat. The Australian tradition of "official war artists" started with the First World War. Artists were granted permission to accompany the Australian Imperial Force to record the activities of its soldiers. During the Second World War, the Australian War Museum, later called the Australian War Memorial, engaged artists. 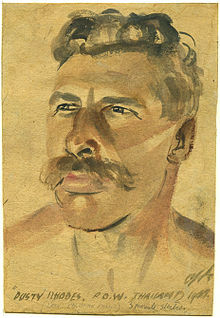 At the same time, the Australian Army, Royal Australian Navy, and Royal Australian Air Force appointed official war artist-soldiers from within their ranks. These embedded war artists have depicted the activities of Australian forces in Korea, Vietnam, East Timor, Afghanistan, and Iraq. The ranks of non-soldier artists like George Gittoes continue to create artwork which becomes a commentary on Australia's military actions in war. Sydney Nolan OM, AC, 1917–1992. Rick Amor, b. 1948, Peacekeeping in East Timor. Peter Churcher, b. 1964, War on Terrorism. George Gittoes AM, b. 1949. Shaun Gladwell, b. 1972, War in Afghanistan. Lewis Miller, b. 1959, War in Iraq. British participation in foreign wars has been the subject of paintings and other works created by Britain's war artists. Artwork like the 1688 painting,The Fleet at Sea by Willem van de Velde the Younger depict the Royal Navy in readiness for battle. The Ministry of Defence art collection includes many paintings showing battle scenes, particularly naval battles. Military art and portraiture has evolved along with other aspects of war. The British official war artists of the First World War created a unique account of that conflict. The British War Artists Scheme expanded the number of official artists and enlarged the scope of their activities during the Second War. Significant themes in the chronicle of twentieth-century wars have been developed by non-military, non-official, civilian artists. For example, society portraitist Arabella Dorman's paintings of wounded Iraq War veterans inspired her to spend two weeks with three regiments in different frontline areas: the Green Jackets at Basra Palace, the Queen's Own Gurkhas at Shaibah Logistics Base ten miles south-west of Basra, and the Queen's Royal Lancers in the Maysaan desert. In the field, Dorman drew quick charcoal portraits of the men she met. Returning to England, the sketches she made helped her use art to "evoke the emotions and psychological impact of war," rather than depicting the "physical horror" of war. John Hodgson Lobley RA, 1878–1954. John Nash CBE RA, 1893–1977. Sir William Orpen KBE RA RHA, 1878–1931. Sir Stanley Spencer RA, 1891–1959. Representative works by Canada's artists whose work illustrates and records war are gathered into the extensive collection of the Canadian War Museum. A few First World War paintings were exhibited in the Senate of Canada Chamber, and artists studied these works as a way of preparing to create new artworks in the conflict in Europe which expanded after 1939. In the Second World War, Canada expanded its official art program; Canadian war artists were a kind of journalist who lived the lives of soldiers. The work of non-official civilian artists also became part of the record of this period. Canada supported Canadian official war artists in both the First World War and the Second World War; no official artists were designated during the Korean War. Among Canada's embedded artist-journalist teams was Richard Johnson, who was sent by the National Post to Afghanistan in 2007 and 2011; his drawings of Canadian troops were published and posted online as part of the series "Kandahar Journal". During the First World War, the work of artists depicting aspects of the military conflict were put on display in official war art exhibitions. In 1916 the Ministry of Beaux-Arts and the Ministry of War sponsored the Salon des Armées to show the work of the artists who had been mobilized. This one exhibition realized 60,000 francs. The proceeds supported needy artists at home and the disabled. War artists have been appointed by the government to supplement the record of New Zealand’s military history. The title of "war artist" changed to "army artist" when Ion Brown was appointed after the two world wars. Conservators at the National Art Gallery considered the collection to be of historic rather than artistic worth; few were displayed. New Zealand's National Collection of War Art encompasses the work of artists who were working on commission for the Government as official war artists, while others created artworks for their own reasons. ^ Imperial War Museum (IWM), header phrase, "war shapes lives"
^ Canadian War Museum (CWM), "Australia, Britain, and Canada in the Second World War," 2005. ^ "About the Imperial War Museum". Iwm.org.uk. Retrieved 2012-07-15. ^ Reid, John B. (1977). Australian Artists at War, Vol. 2, p. 5. ^ National Archives (UK), "'The Art of War,' Learn About the Art." ^ Gauldie, Matt. "History of the NZ Army Artist"
^ "Marine Art,". Nytimes.com. 2010-07-14. Retrieved 2012-07-15. ^ Harrington, Peter. "The First True War Artist," MHQ: The Quarterly Journal of Military History, Vol. 9, No. 1, Autumn 1996, pp. 100–109. ^ a b Steve Bell (2010-03-09). "Ronald Searle: a life in pictures,". London: Guardian. Retrieved 2012-07-15. ^ Grove, Valerie. "Aged 90, Ronald Searle recalls the bad girls of St Trinian's,"The Times (London). February 20, 2010. ^ a b "Navy Combat Art Program". History.navy.mil. 1966-09-15. Retrieved 2012-07-15. ^ a b United States Army Center of Military History (CMH), Army Art Program History. ^ Pollock. "U.S. Army Vietnam Combat Art Program". Pie.midco.net. Retrieved 2012-04-21. ^ Rocco, Keith et al. (2004). The Soldier's View: The Civil War Art of Keith Rocco. ^ a b c d e "artists, p. 1". History.army.mil. 1918-07-10. Retrieved 2012-07-15. ^ a b c d "artists, p. 2". History.army.mil. Retrieved 2012-07-15. ^ "McClelland Barclay, Naval Art Collection". History.navy.mil. Retrieved 2012-07-15. ^ "Artist, Teacher, and Innovator Franklin Boggs". Beloit College Magazine. Beloit, Wisconsin: Beloit College (240622). Spring 2010. Retrieved 7 May 2016. ^ a b "''They Drew Fire: Combat Artists of World War II,''". Pbs.org. Retrieved 2012-07-15. ^ Howard Brodie. 1st broadcast, May 2000. ^ "18 Mar 1945, 109 - The San Francisco Examiner at Newspapers.com". Newspapers.com. Retrieved 2019-03-25. ^ "Olin Dows". History.army.mil. Retrieved 2012-07-15. ^ "William Franklin Draper, Naval Art Collection". History.navy.mil. Retrieved 2012-07-15. ^ "William Draper". Pbs.org. Retrieved 2012-07-15. ^ "Noted WWII artist Nathan Glick visits Demopolis - The Demopolis Times". The Demopolis Times. 2008-11-06. Retrieved 2019-03-26. ^ "13 Mar 1947, Page 26 - The Indiana Gazette at Newspapers.com". Newspapers.com. Retrieved 2019-03-24. ^ "21 Mar 1950, 9 - The Lincoln Star at Newspapers.com". Newspapers.com. Retrieved 2019-03-24. ^ a b c "7 Nov 1949, 11 - The Tampa Tribune at Newspapers.com". Newspapers.com. Retrieved 2019-03-23. ^ Edward Reep 1st broadcast, May 2000. ^ "IN RECOGNITION OF WORLD WAR II VETERANS WHO SERVED AS COMBAT ARTISTS: DoD 50th Anniversary of WWII". the Congressional Record Online through the Government Printing Office [www.gpo.gov]. Congressional Record Volume 141, Number 106 (Tuesday, June 27, 1995). Retrieved 22 May 2018. ^ "Obituaries : Taro Yashima; Artist, Author Aided U.S. in World War II". Los Angeles Times. 1994-07-06. ISSN 0458-3035. Retrieved 2019-03-25. ^ "Yasuo Kuniyoshi | Densho Encyclopedia". encyclopedia.densho.org. Retrieved 2019-03-25. ^ Perricelli, Lynne Moss. "Drawing: Henry Casselli: Drawing From the Inside Out," American Artist. 7 Mar 2008. ^ Wilkins, Lola. "Interpreting the war: Australia's Second World War art." CWM, 2005. ^ a b Strauss, David Levi. "George Gittoes with David Levi Strauss," The Brooklyn Rail (New York). July 8, 2010; Order of Australia, George Gittoes, AM, excerpt of citation, "For service to art and international relations as an artist and photographer portraying the effects on the environment of war, international disasters and heavy industry". ^ a b c d e f g h i j "World War I, official artists". Awm.gov.au. Retrieved 2012-07-15. ^ Gray, Anne. (1986). "McCubbin, Louis Frederick (1890–1952)," Australian Dictionary of Biography, Vol. 10, pp. 243–244; excerpt, "Appointed an official war artist under the Australian Records Section scheme to the 3rd Division, he visited scenes of battles with Wallace Anderson and Charles Web Gilbert after the war to collect data for proposed dioramas. ^ a b c d e f g "Second World War, official artists". Awm.gov.au. Retrieved 2012-07-15. ^ Gill Clarke (2008). The Women's Land Army A Portrait. Sansom & Company. ISBN 978-1-904537-87-8. ^ "William Dobell" (in French). Civilization.ca. Retrieved 2012-07-15. ^ "Russell Drysdale" (in French). Civilization.ca. Retrieved 2012-07-15. ^ "Sydney Nolan" (in French). Civilization.ca. Retrieved 2012-07-15. ^ "Grace Cossington Smith" (in French). Civilization.ca. Retrieved 2012-07-15. ^ a b c d e f g h "Conflicts 1945 to today, official artists". Awm.gov.au. Retrieved 2012-07-15. ^ Tolson, Roger. "A Common Cause: Britain's War Artists Scheme." CWM, 2005. ^ Harrison, David. "War artist Arabella Dorman paints Iraq," Telegraph (London). May 2, 2009. 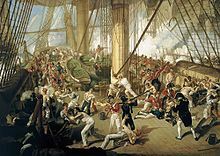 ^ National Maritime Museum (NMM), The Fall of Nelson, Battle of Trafalgar, 21 October 1805 by Denis Dighton, c. 1825. ^ "Bacon, 1868–1914". Artnet.com. Retrieved 2012-07-15. ^ Charles Edwin Fripp; excerpt, "Fripp also held a commission in the Artists Rifles for 13 years ...."
^ a b c d "War artists". Mod.uk. 2007-03-14. Retrieved 2012-07-15. ^ Imperial War Museum. "Gassed and Wounded [Art.IWM ART 4744]". IWM Collections Search. Retrieved 16 April 2013. ; also a war artist in the Second World War. ^ "John Hodgson Lobley, 1878–1954". BBC in partnership with The Public Catalogue Foundation. Archived from the original on 2012-10-04. ^ "Witness – Highlights of First World War Art" (PDF). Imperial War Museum. ^ Imperial War Museum. "'Over The Top'. 1st Artists' Rifles at Marcoing, 30th December 1917 [Art.IWM ART 1656]". IWM Collections Search. Retrieved 16 April 2013. ; also a war artist in World War II. ^ Imperial War Museum. "The Menin Road [Art.IWM ART 2242]". IWM Collections Search. Retrieved 16 April 2013. ; also a war artist in World War II. ^ Imperial War Museum. "Paths of Glory [Art.IWM ART 518]". IWM Collections Search. Retrieved 16 April 2013. ^ Imperial War Museum. "Harvest, 1918 [Art.IWM ART 4663]". IWM Collections Search. Retrieved 16 April 2013. ; also a war artist in World War II. ^ Imperial War Museum. "Travoys Arriving with Wounded at a Dressing-Station at Smol, Macedonia, September 1916, 1919 [Art.IWM ART 2268]". IWM Collections Search. Retrieved 12 Nov 2013. ; also a war artist in World War II. ^ "WarMuseum.ca - Art and War - British artist - Edward Ardizzone" (in French). Civilization.ca. Retrieved 2012-07-15. ^ "Edward Bawden" (in French). Civilization.ca. Retrieved 2012-07-15. ^ "Henry Carr" (in French). Civilization.ca. Retrieved 2012-07-15. ^ "Eliot Hodgkin". Imperial War Museums. Retrieved 2012-09-16. ^ "Laura Knight" (in French). Civilization.ca. Retrieved 2012-07-15. ^ "Philip Meninsky". Imperial War Museum. Retrieved 2013-04-25. ^ "Ministry of Defence | About Defence | What we do | Defence Estate and Environment | MOD Art Collection | Ministry of Defence Art Collection". Mod.uk. Retrieved 2012-07-15. ^ "Albert Richards (1919–1945)". Collection.britishcouncil.org. Retrieved 2012-04-21. ^ "Ruskin Spear" (in French). Civilization.ca. Retrieved 2012-07-15. ^ Imperial War Museum. "Shipbuilding on the Clyde: Bending the Keel Plate, 1943 [Art.IWM ART LD 3106]". IWM Collections Search. Retrieved 12 Nov 2013. ; also a war artist in World War I. ^ "Graham Sutherland" (in French). Civilization.ca. Retrieved 2012-07-15. ^ "Carel Weight" (in French). Civilization.ca. Retrieved 2012-07-15. ^ Derek Eland (1 September 2011). "Helmand". derekeland.com. Retrieved 24 April 2013. ^ a b c "Contemporary War Artists: Introduction". Imperial War Museum. ^ "Contemporary War Artists: Peter Howson: Bosnia". Imperial War Museum. Archived from the original on 6 January 2009. Retrieved 19 April 2013. ^ "Contemporary War Artists: John Keane: The Gulf War". Imperial War Museum. Archived from the original on 6 January 2009. Retrieved 19 April 2013. ^ "Women at war: The female British artists who were written out of history". London: Independent. 8 April 2011. ^ "Falklands War 1982, Linda Kitson's artistic record". Imperial War Museum. Retrieved 20 April 2013. ^ "Alfred Bastien" (in French). Civilization.ca. Retrieved 2012-07-15. ^ a b Brandon, Laura. "'Doing Justice to History:' Canada's Second World War Official Art Program." CWM, 2005. ^ a b c d e f g Art Gallery of Ontario, "Canvas of War: Masterpieces from the Canadian War Museum," October 2001 – January 2002. ^ "North Korea: The Forgotten War," CBC News (Canadian Broadcasting Company). July 18, 2003. ^ Johnson, Richard. "Kandahar Journal | National Post". nationalpost.com. Retrieved April 20, 2012. ^ "Eric Aldwinckle - Nothing Uninteresting". ericaldwinckle.info. Retrieved 18 July 2013. ^ "Donald Kenneth Anderson, RCAF: Official War Artist". Stephenmccanse.com. Retrieved 2012-04-21. ^ "Molly Lamb Bobak". Epe.lac-bac.gc.ca. Retrieved 2012-07-15. ^ "David Alexander Colville". Epe.lac-bac.gc.ca. Retrieved 2012-07-15. ^ "Charles Fraser Comfort". Epe.lac-bac.gc.ca. Retrieved 2012-07-15. ^ The Art of War," Canadian Army Journal, Vol. 12.3. Winter 2010. pp. 102–103. ^ McCloskey, Barbara. (2005). Artists of World War II, p. 50. ^ McCloskey, p. 50; Yenne, William P. German War Art, 1939–1945. ^ a b German Official War Artists Archived 2010-07-22 at the Wayback Machine, citing German War Art 1939–45 by William Yenne. ^ "Contemporary Conflist >> Women War Artists". Imperial War Museum London. ^ "Women War Artists: Focus on Frauke Eigen". Imperial War Museum channel on YouTube. ^ Okamoto, Shumpei. (1983). Impressions of the Front: Woodcuts of the Sino Japanese War, 1894–95, pp. 21, 27. ^ Nussbaum, "Fujita Tsuguharu" in Japan Encyclopedia, p. 200; McCloskey, p. 117. ^ Nussbaum, "Ogata Gekkō" in Japan Encyclopedia, p. 737. ^ Nussbaum, Louis Frédéric et al. (2005). "Migita Toshihide" in Japan Encyclopedia, p. 628. ^ Complutense University of Madrid, Biblioteca Histórica Marqués de Valdecilla. Exposición "Flores de Edo: samuráis, artistas y geishas" 4 November 2004 – 10 January 2005. ^ Salmon, Andrew. "A Cartoonist at War: 'Gobau's' Korea, 1950," The Asia-Pacific Journal, July 13, 2009; "A teenage cartoonist’s diary of horrors," JoongAng Ilbo. July 10, 1010. ^ Archives New Zealand (Archives NZ), War Art. ^ a b c d New Zealand Army (NZ Army), NZ Army Artist, Matt Gauldie. ^ "What is War Art". Warart.archives.govt.nz. 1918-09-22. Retrieved 2012-07-15. ^ "War Art, Artist biographies". Warart.archives.govt.nz. Retrieved 2012-07-15. ^ "George Edmund Butler". Warart.archives.govt.nz. Retrieved 2012-07-15. ^ "James Boswell". Warart.archives.govt.nz. 1944-05-15. Retrieved 2012-07-15. ^ "Russell Clark". Warart.archives.govt.nz. Retrieved 2012-07-15. ^ "John McIndoe". Warart.archives.govt.nz. Retrieved 2012-07-15. ^ "Peter McIntyre's war art online''". Warart.archives.govt.nz. Retrieved 2012-07-15. ^ "Artist Profile". Ion Brown. Retrieved 2012-04-21. ^ "NZ Army - NZ Army Artist". Army.mil.nz. Retrieved 2012-04-21. ^ Fisher, David. "Feature: Capturing the Moment," New Zealand Listener (June 28 – July 4, 2008) Vol. 214, No. 3555. About light and dark in peace and war and a piece of Vietnam by Lance Nixon, Capital Journal (South Dakota), 17 January 2014. Drawing fire by Lance Nixon, Capital Journal (South Dakota), 23 January 2014. A photograph of a war is different from a painting “that’s not rocket science” by Dave Askins, Capital Journal (South Dakota), 20 April 2018. SDPB Radio Interview MIDDAY Karl Gehrke interviews James Pollock, 10 June 2015.